← Is there a cure for stupidity? This entry was posted in Beginner, Dresses, Sewing, TNT's, Vogue. Bookmark the permalink. Thanks for the mention! I didn’t get a chance to comment yesterday, but I made the same mistake you did (actually on a few different wrap dresses I’ve made this mistake.) So don’t feel stupid about it! Can’t wait to see the modeled pics! Our gala event is tomorrow so I will have modeled pictures of our outfits either tomorrow before we leave or on Sunday! That’s a great fabric choice for that pattern. Can’t wait to see the final product! Erica B also came to this conclusion (http://www.ericabunker.com/2008/08/vogue-8379-wrap-dress.html) but she chose KS3489 as her TNT wrap dress. I looks to me that KS3489 is an updated version of KS3408 although I could be wrong. I made both V8379 and KS3489 based on Erica’s reviews and agree the KS pattern is more to my liking with the slimmer skirt and the various sleeve and collar options. That is a perfect set in sleeve. Love that print. 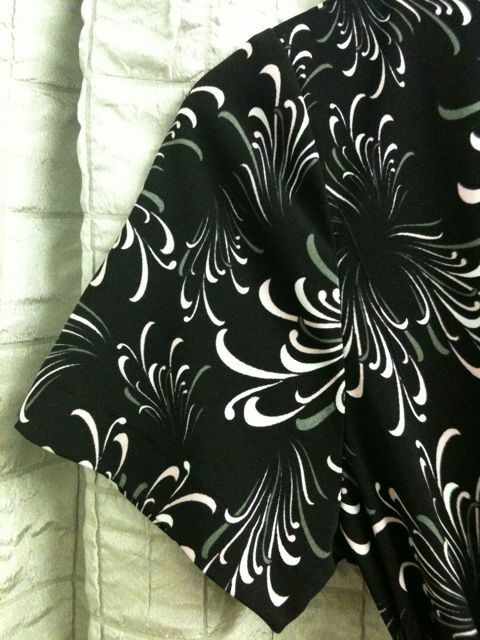 Love the print and after reading Robin’s review ordered the Kwik Sew pattern… need to bump it up on my to sew list.